8vo original cloth illustrated 572 pp. Binding shows some moderate wear and top hinge is weak. Tape repair to front endpaper, rubber stamp and owner signature on front endpaper, normal aging; otherwise very good. Many illustrations, including an illuminated title page by Thomas Nast. Text and illustrations try and give a feel for life on the prairies, mountains and the Pacific Coast. Richardson presents views of Indians, trappers, pioneers and some of the curiosities of the western territories in his work. American Publishing Co., 1867. 1st Edition 1st Printing. Hardcover. Good/No Jacket. 8vo - over 7¾ - 9¾" tall. Good condition, no DJ. First edition, first printing. No markings to the text block. Previous owner's markings on the inside front cover and earlier price on front free end paper. End papers over hinges cracked but still strong. Corners bumped and worn through. Top and bottom of spine frayed and worn (see our photo). Rear cover discolored. 2007-10-09. New. Ships with Tracking Number! INTERNATIONAL WORLDWIDE Shipping available. Buy with confidence, excellent customer service! 8vo original cloth illustrated 572 pp. Binding shows some moderate wear and top hinge is weak. Also, some moderate toning and foxing. One illustration is detached. Many illustrations, including an illuminated title page by Thomas Nast. Text and illustrations try and give a feel for life on the prairies, mountains and the Pacific Coast. Richardson presents views of Indians, trappers, pioneers and some of the curiosities of the western territories in his work. 2015-08-24. New. Ships with Tracking Number! INTERNATIONAL WORLDWIDE Shipping available. Buy with confidence, excellent customer service! 20120222. Good. Ships with Tracking Number! INTERNATIONAL WORLDWIDE Shipping available. May not contain Access Codes or Supplements. May be ex-library. Shipping & Handling by region. Buy with confidence, excellent customer service! Hartford, Conn: American Publishing Company, 1867. Cf. Flake 7256; Rader 2782; Raines, p. 173; Sabin 70980). Original publisher's tan half-sheep binding with marbled paper boards. General binding wear & rubs. A VG copy.. xvi,  - 572 pp. Frontis map. Engraved t.p. Wood engravings throughout text. 8vo. Condition: General binding wear & rubs. A VG copy. 2009-03-19. Good. Ships with Tracking Number! INTERNATIONAL WORLDWIDE Shipping available. May not contain Access Codes or Supplements. May be ex-library. Shipping & Handling by region. Buy with confidence, excellent customer service! Beyond the Mississippi: From the Great River to the Great Ocean. Life and Adventure on the Prairies, Mountains, and Pacific Coast. Hartford: American Publishing, 1869. 1st. Hardcover. Very good. Bound in the publisher's original brown cloth over boards, spine and cover stamped in gilt. Cloth is rubbed at the extremities, particularly at the head & heel. Marbled endpapers. With more than two hundred illustrations throughout. Hartford, CT: American Publishing Company. First Edition. Rebound in sturdy crimson buckram. 572 pp. Few small spots on top edges, 2-page frontispiece map not present but full-page etching at the front present, occasional leaf with a small spot on it, internals nice, Very Good apart from the missing map. . Very Good. Hardcover. 1st Edition. 1867. American Publishing Company, Hartford, CT: (1867), 1867. 572 p. + Half title and two page map. Map loose with slight tear in margin. Profusely illustrated with full page plates and text drawings. Age stain. Manuscript ownership of Charles H. Rowes, Whitehall Station, PA, 1869 on front fly leaf. 225 mm. Original full leather binding, worn with loss at head and tail of spine. Boards fragile. Hardbound. Good. Albert Deane Richardson (1833-1869) was a well-known American journalist, Union spy, adventurer, and author. This work describes trip through Texas, from Preston to El Paso, on the U.S. Mail coach. Full of keen with observations. This is a greatly expanded version of Howes R253; Sabin 70980; Raines p. 173. **PRICE JUST REDUCED! W7. Full Leather. Hardcover. Fair. American Publishing, 1867. First edition, first printing. Hinges repaired, some short tears to spine tips, good to very good in custom cloth clamshell case. B&W illustrations and maps. Condition: Hinges repaired, some short tears to spine tips, good to very good in custom cloth clamshell case. American Publishing Company, Hartford, CT: (1867) 572 p. + Half title and two page map. Profusely illustrated with full page plates and text drawings. No front fly leaf. Preliminary leaves detached but present and complete. 8vo. 225 mm. Original full publisher's cloth binding, rubbed at extremities. Hardbound. Very good. Albert Deane Richardson (1833-1869) was a well-known American journalist, Union spy, adventurer, and author. This work describes trip through Texas, from Preston to El Paso, on the U.S. Mail coach. Full of keen with observations. This is a greatly expanded version of Howes R253; Sabin 70980; Raines p. 173. **PRICE JUST REDUCED! W7. Full Cloth. Hardcover.. Good. Hartford, Connecticut: American Publishing Company, 1867. FIRST EDITION, first printing. Green cloth-tape reinforcement at the spine. Heavy wear. Overall a READING COPY ONLY. BEYOND THE MISSISSIPPI. This book details a trip through Texas on the U.S. Mail coach from Preston to El Paso, with observations on the country! An important book in the history of American Westward Expansion. With more than two hundred illustrations. Albert Deane Richardson (October 6, 1833 - December 2, 1869) was a well-known American journalist, Union spy, and author. TIMELINE: Richardson was born in Franklin, Massachusetts, Oct. 6, 1833. Obtained first job with newspaper, Pittsburgh Journal, 1851. Married Mary Louise Pease, April 1855. Correspondent for the Boston Journal, 1857. Edited The Western Mountaineer of Golden City, Colorado, 1860. Journalist for the New York Daily Tribune. Captured by the Confederates at Vicksburg, May 3, 1863. Wife and daughter died. Escaped Salisbury, NC, prison, December 18, 1864. Shot by Daniel McFarland, March 14th, 1867. Wrote Through to the Pacific for the New York Tribune, May-June, 1869. Shot again by Daniel McFarland, November 25, 1869. Married Abby Sage McFarland, November, 1869; marriage performed by Henry Ward Beecher. Died December 2, 1869 (McFarland acquitted in a sensational trial). UncleAndy. First Edition. Full Cloth. Poor. 8vo - over 7¾" - 9¾" tall. Hardcover. Hartford:: American Publishing Company. Hardcover. 572 pp. 8vo. Newly rebound cloth hardcover, with new endpapers and the original title label to the spine. Browning to textblock, browning, damp-staining and soiling to the half-title margins. Foxing and soiling scattered throughout - does not interfere with readability. Small piece of upper corner chipped from approx first 15 pgs, chipping to fore-edge of pg 572. Includes over 200 b&w illustrations. 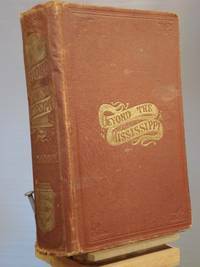 "Beyond the Mississippi: From teh Great River to the Great Ocean. Life and Adventure on the Prairies, Mountains, and Pacific Coast." . Very Good. 1867..
Hartford, CT: American Publishing Co., 1867. 572pp. ; HB green w/gilt-old cover pasted on rebind-new endpapers; some rub w/lt.wear; tanned pgs.w/corner-folds&lt.foxing. "With more than two hundred illustrations, from photographs and original sketches, of the praireis, deserts, mountains, rivers, mines, cities, indians, trappers, pioneers. and great natural curiosities of the new states and territories. 1857-1867". Hard Cover. Very Good/No Jacket. 8vo - over 7¾" - 9¾" tall. Rebind. Hartford: American Publishing Company, 1867. Map frontispiece, engraved title page, 572p, illustrations. 23cm. Leather covers with black morocco spine label in gilt. Joints cracked and held by cords; back strip taped, edges rubbed; tape ghost on endpapers; prior owner's signature on the second fly leaf. A fair copy. Hartford, CT: American Publishing Co., 1867. 572pp. ; HB maroon&gilt-gilt trim; rubbed w/edges&corners worn; lt.dampstain,tp.edge; fox on endpapers w/clean,tight pgs. "With more than two hundred illustrations, from photographs and original sketches, of the praireis, deserts, mountains, rivers, mines, cities, indians, trappers, pioneers. and great natural curiosities of the new states and territories. 1857-1867". Hard Cover. Good/No Jacket. 8vo - over 7¾" - 9¾" tall. American Publishing Co., 1867. 1st Edition 1st Printing. Hardcover. Very Good/No Jacket. 8vo - over 7¾ - 9¾" tall. Very Good condition, no DJ. First edition, first printing. No markings to the text block. Previous owner's markings on the reverse of the front free end paper. Some signatures loose. Corners bumped and rubbed through. Top and bottom of spine frayed. General soiling to covers. Some water staining to top inside corner of the text block. Front free end paper sloppily reglued. Nabu Press, 2010-08-27. Paperback. Good. Arkose Press. Hardcover. 1345347820 Special order direct from the distributor . New. Cooper Press, 2007-10-09. Paperback. Good. Cooper Press, 2007-10-09. Paperback. Used:Good. 2019. Leather Bound. New. Leather Binding on Spine and Corners with Golden Leaf Printing on round Spine (extra customization on request like complete leather, Golden Screen printing in Front, Color Leather, Colored book etc.) Reprinted in 2019 with the help of original edition published long back . This book is printed in black & white, sewing binding for longer life, Printed on high quality Paper, re-sized as per Current standards, professionally processed without changing its contents. As these are old books, we processed each page manually and make them readable but in some cases some pages which are blur or missing or black spots. If it is multi volume set, then it is only single volume, if you wish to order a specific or all the volumes you may contact us. We expect that you will understand our compulsion in these books. We found this book important for the readers who want to know more about our old treasure so we brought it back to the shelves. Hope you will like it and give your comments and suggestions. Lang: - eng, Pages 676. EXTRA 10 DAYS APART FROM THE NORMAL SHIPPING PERIOD WILL BE REQUIRED FOR LEATHER BOUND BOOKS. COMPLETE LEATHER WILL COST YOU EXTRA US$ 25 APART FROM THE LEATHER BOUND BOOKS. 2019. Leather Bound. New. Leather Binding on Spine and Corners with Golden Leaf Printing on round Spine (extra customization on request like complete leather, Golden Screen printing in Front, Color Leather, Colored book etc.) Reprinted in 2019 with the help of original edition published long back . This book is printed in black & white, sewing binding for longer life, Printed on high quality Paper, re-sized as per Current standards, professionally processed without changing its contents. As these are old books, we processed each page manually and make them readable but in some cases some pages which are blur or missing or black spots. If it is multi volume set, then it is only single volume, if you wish to order a specific or all the volumes you may contact us. We expect that you will understand our compulsion in these books. We found this book important for the readers who want to know more about our old treasure so we brought it back to the shelves. Hope you will like it and give your comments and suggestions. Lang: - eng, Pages 670. EXTRA 10 DAYS APART FROM THE NORMAL SHIPPING PERIOD WILL BE REQUIRED FOR LEATHER BOUND BOOKS. COMPLETE LEATHER WILL COST YOU EXTRA US$ 25 APART FROM THE LEATHER BOUND BOOKS. 2019. Leather Bound. New. Leather Binding on Spine and Corners with Golden Leaf Printing on round Spine (extra customization on request like complete leather, Golden Screen printing in Front, Color Leather, Colored book etc.) Reprinted in 2019 with the help of original edition published long back . This book is printed in black & white, sewing binding for longer life, Printed on high quality Paper, re-sized as per Current standards, professionally processed without changing its contents. As these are old books, we processed each page manually and make them readable but in some cases some pages which are blur or missing or black spots. If it is multi volume set, then it is only single volume, if you wish to order a specific or all the volumes you may contact us. We expect that you will understand our compulsion in these books. We found this book important for the readers who want to know more about our old treasure so we brought it back to the shelves. Hope you will like it and give your comments and suggestions. Lang: - eng, Pages 662. EXTRA 10 DAYS APART FROM THE NORMAL SHIPPING PERIOD WILL BE REQUIRED FOR LEATHER BOUND BOOKS. COMPLETE LEATHER WILL COST YOU EXTRA US$ 25 APART FROM THE LEATHER BOUND BOOKS. Beyond the Mississippi: from the great river to the great ocean : life and adventure on the prairies, mountains, and Pacific Coast : with more than ... of the praries, deserts, mountains,..
2019. Leather Bound. New. Leather Binding on Spine and Corners with Golden Leaf Printing on round Spine (extra customization on request like complete leather, Golden Screen printing in Front, Color Leather, Colored book etc.) Reprinted in 2019 with the help of original edition published long back . This book is printed in black & white, sewing binding for longer life, Printed on high quality Paper, re-sized as per Current standards, professionally processed without changing its contents. As these are old books, we processed each page manually and make them readable but in some cases some pages which are blur or missing or black spots. If it is multi volume set, then it is only single volume, if you wish to order a specific or all the volumes you may contact us. We expect that you will understand our compulsion in these books. We found this book important for the readers who want to know more about our old treasure so we brought it back to the shelves. Hope you will like it and give your comments and suggestions. Lang: - eng, Pages 632. EXTRA 10 DAYS APART FROM THE NORMAL SHIPPING PERIOD WILL BE REQUIRED FOR LEATHER BOUND BOOKS. COMPLETE LEATHER WILL COST YOU EXTRA US$ 25 APART FROM THE LEATHER BOUND BOOKS. 2019. Leather Bound. New. Leather Binding on Spine and Corners with Golden Leaf Printing on round Spine (extra customization on request like complete leather, Golden Screen printing in Front, Color Leather, Colored book etc.) Reprinted in 2019 with the help of original edition published long back . This book is printed in black & white, sewing binding for longer life, Printed on high quality Paper, re-sized as per Current standards, professionally processed without changing its contents. As these are old books, we processed each page manually and make them readable but in some cases some pages which are blur or missing or black spots. If it is multi volume set, then it is only single volume, if you wish to order a specific or all the volumes you may contact us. We expect that you will understand our compulsion in these books. We found this book important for the readers who want to know more about our old treasure so we brought it back to the shelves. Hope you will like it and give your comments and suggestions. Lang: - eng, Pages 630. EXTRA 10 DAYS APART FROM THE NORMAL SHIPPING PERIOD WILL BE REQUIRED FOR LEATHER BOUND BOOKS. COMPLETE LEATHER WILL COST YOU EXTRA US$ 25 APART FROM THE LEATHER BOUND BOOKS. 2019. Leather Bound. New. Leather Binding on Spine and Corners with Golden Leaf Printing on round Spine (extra customization on request like complete leather, Golden Screen printing in Front, Color Leather, Colored book etc.) Reprinted in 2019 with the help of original edition published long back . This book is printed in black & white, sewing binding for longer life, Printed on high quality Paper, re-sized as per Current standards, professionally processed without changing its contents. As these are old books, we processed each page manually and make them readable but in some cases some pages which are blur or missing or black spots. If it is multi volume set, then it is only single volume, if you wish to order a specific or all the volumes you may contact us. We expect that you will understand our compulsion in these books. We found this book important for the readers who want to know more about our old treasure so we brought it back to the shelves. Hope you will like it and give your comments and suggestions. Lang: - eng, Pages 631. EXTRA 10 DAYS APART FROM THE NORMAL SHIPPING PERIOD WILL BE REQUIRED FOR LEATHER BOUND BOOKS. COMPLETE LEATHER WILL COST YOU EXTRA US$ 25 APART FROM THE LEATHER BOUND BOOKS.